Will Mars be the ‘Rosetta Stone’ in the Search for Life in the Universe? With Sunday's successful landing of the Mars Science Lab, the search for life has taken on a new sense of urgency. The Curiosity Science Mission goal is to look for chemical evidence of ancient life preserved within exposures near the base of a five-kilometers high mound of layered materials at the center of Gale crater. But the red planet says Robert Zubrin, founder of The Mars Society, is essentially a Rosetta stone for determining the prevalence and diversity of life in the universe. "If we can go to Mars and find evidence of past life, then we will have proved that the development of life from chemistry is a general phenomenon in the universe," Zubrin has said in an interview with Discovery Magazine. On Mars, as on Earth, methane is extremely unstable because it's continually being broken up by ultraviolet rays from the Sun and chemical reactions with other gases. The average life of a methane molecule on Mars is 400 years, which means the gas must be continually replenished or it will disappear. Something is producing methane on Mars today -the big question is: What? There is potentially a vast biosphere a few meters below Mars' surface, which the Viking mission may not have been able to access since it was only scratching the surface of the uppermost layer of soil. Yet to this day, Gilbert Levin, the principal designer of the LR experiment, believes the tests pointed to life. When the same two experiments were run on soil from Antarctica, the same conflicting results were obtained (LR – positive; organics – negative.) Soil and ice from Antarctica's Dry Valley certainly contains extreme life forms. The test for organics was negative because it is far less sensitive than the LR experiment. The same problem could have caused the organics test on to give a false negative. Before oxygen could accumulate in Earth's atmosphere, all the exposed iron had to rust. During that process, lasting hundreds of millions of years, Earth was also a red planet. In the journal Nature, Corinna Wu has asked: Could the oxygen that rusted the iron on have been produced biologically? Could life on have simply "run out of steam" after that stage of its development? 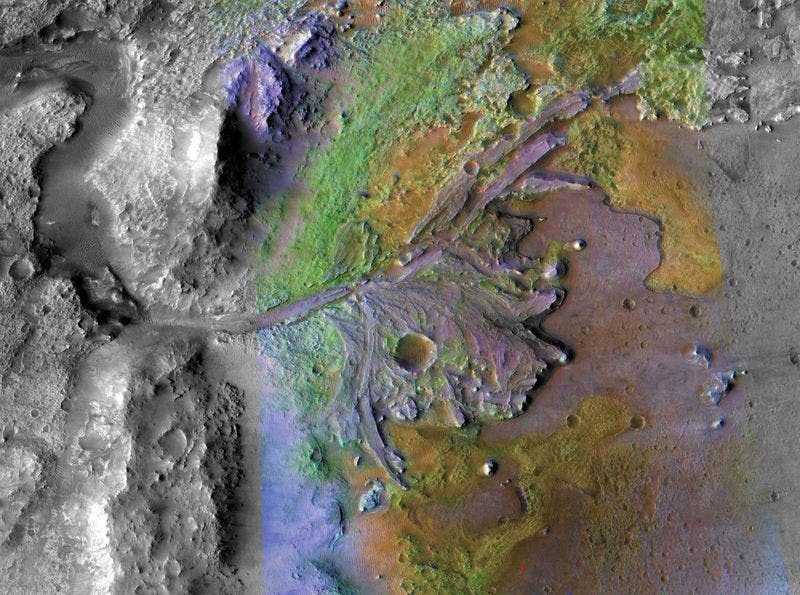 Recent NASA and Mars Express images suggest that Mars was warm enough to sustain lakes and rivers three billion years ago, a period that was previously thought to be too cold and arid to sustain water on the surface. Research by a team from Imperial College London and University College London (UCL), suggests that during the Hesperian Epoch, approximately 3 billion years ago, Mars had lakes made of melted ice, each around 20km wide, along parts of the equator. In another study, the researchers analysed detailed images from NASA's Mars Reconnaissance Orbiter, which is currently circling the red planet, and concluded that there were later episodes where Mars experienced warm and wet periods. The researchers analyzed the depressions and discovered a series of small sinuous channels that connected them together. The researchers say these channels could only be formed by running water, and not by ice turning directly into gas. It's entirely possible that Mars goes through periods of reawakening of its biosphere during spells when a surge of liquid surface water becomes available from heightened volcanic activity that pump vast quantities of greenhouses gases into the atmosphere and dormant cycles when lengthier cold and dry periods prevail as is the case on Mars today.